There are a lot of great school fundraisers out there for you to choose from, but some of them work better for certain age groups. Elementary kids are more “simple and fun” oriented, while high school students are geared toward fundraising ideas they can operate by themselves, ideally with a little competition thrown in. You’re sure to find a great school fundraiser for any grade level in this list. Place a pack of straws into an opaque jar with the ends sticking up. Write unique rewards on pieces of paper, and attach them to the bottom of each straw, hidden from view. For a small donation amount, kids can draw a straw and get a reward. You can price certain straws at different price points, depending on how big the reward is. Extra recess time, no homework, cookies, or a game of 7-Up are all exciting for younger kids. You can place a jar of straws in the teacher’s lounge, too! Place a small fish tank (without fish in it!) in the front of your school and have students drop spare change into it. Mark checkpoints on the side of the bowl. When the school hits a checkpoint, they get a school-wide reward. Thermometers use a similar concept. Craft a paper thermometer in a common area of your school. Ask students to donate in the morning after the pledge. As the school raises money, the temperature rises and students earn rewards. These ideas are great school fundraisers because they provide a 100% profit margin. Simple things like this can go a long way with younger kids. Your slobbery canine companion finally gets their chance in the spotlight with a dog show at school! Parents and students are charged an entry fee to show off their pets. Make a runway for the dogs and have judges vote for best-in-class awards. Dog shows can be funny when pets are dressed up and misbehave. Ice cream socials work really well for extra-curricular groups like band, orchestra, and sports teams. Set up a create-your-own sundae line with different ice cream flavors, toppings, and sauces. Charge each student a fee to make their sundae. You can combine this idea with a silent auction, too. When high school students start driving, they’re really proud of their cars. Team up with a local business and have them make custom school-themed car decals. Sell them at sporting events, band concerts, and other extracurricular activities. You can create special decals for each program in your school. Parents love to buy decals with their kids’ name on them, so consider having them customized in that way, too. Ask members of your community to donate their old prom dresses to your high school. Retro designs are making a big comeback, and thrift shopping is already really popular with high schoolers. Set up a pop-up store in an empty classroom, and sell the prom dresses at low prices. We’re proven to be a great school fundraiser at every level. Elementary, middle, and high schools have all found big success with World’s Finest® Chocolate. When kids sell delicious chocolate in your community (with parental guidance), they develop important interpersonal and personal finance skills. Best of all, our chocolate bars cost your supporters only $1 or $2, and with a large fundraising project, earn your organization a 50% profit margin! You’re also provided with your own local representative who will help you set goals and finish successfully. If our chocolate doesn’t earn you as much profit as your last similar fundraiser, we’ll match your previous profits and add 10% on top! Speak with your local representative today to get started quickly. 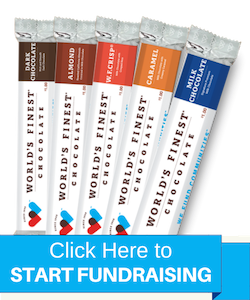 Or, check out our free fundraising guide to read about all the benefits of partnering with World’s Finest® Chocolate for your next school fundraiser.